Speyer, Renée (2012) Behavioural treatment of oropharyngeal dysphagia: bolus modification and management, sensory and motor behavioural techniques, postural adjustments, and swallow manoeuvres. In: Ekberg, Olle, (ed.) Dysphagia: diagnosis and treatment. Medical Radiology: diagnostic imaging . Springer, Heidelberg, Germany, pp. 477-491. This chapter gives an overview of the most common behavioural techniques for treating oropharyngeal dysphagia, namely bolus modification and management, sensory and motor behavioural techniques, postural adjustments, and swallow manoeuvres. Each intervention is described along with its rationale. 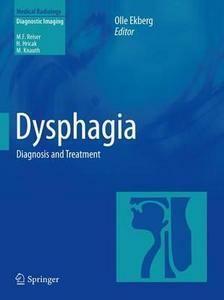 Furthermore, in light of the literature, the effects of dysphagia treatment are discussed as well as some methodological issues that emerged from a review of outcome studies.